My mother used to make this salad when I was much younger, but it took many years for me to truly appreciate it. 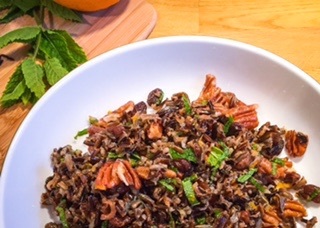 I love the texture of the split wild rice, which sadly has become too expensive to make this often, although it also works well mixed with brown rice, and it is best served at room temperature. Add the rice and stock (or water) to a medium-sized saucepan. Bring to the boil and then reduce the heat to a gentle simmer, uncovered. Cook for 45 mins, testing the rice after 30 mins (the rice should not be too soft), and then drain. Whilst the rice is cooking put all the other ingredients into a bowl and then add the drained rice. Toss gently and check the seasoning before leaving for a couple of hours for the flavours to fully develop. Thank you!!! I promise to work on getting some better pictures in future to make them Pin worthy.